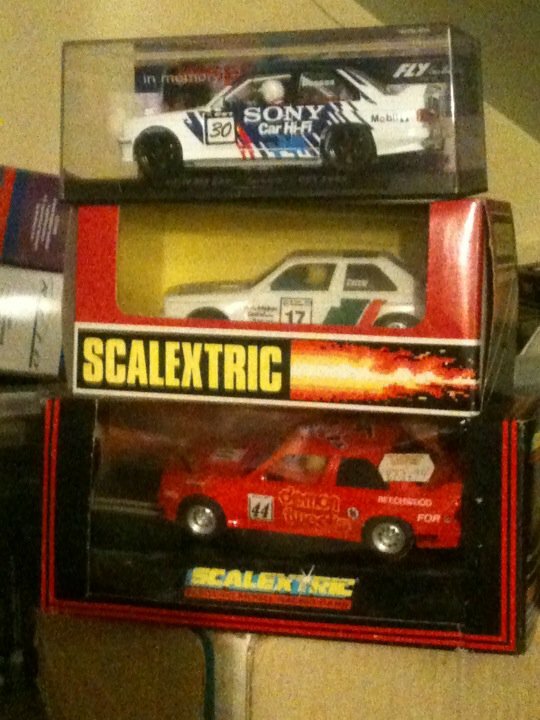 I collect Slot (Scalextric type) Rally Cars. My collection is around the 1000 in number (not actually got around to finally cataloging everything). Most of the collection is 1;32 Scale, but there are a few 1;24, 1;28, 1;43 and HO scale in there. Most (approx 60%) of the collection is on display on my web site; www.slotrallygb.com the web site is a labour of love and takes for ever to complete, but it's getting there. I also run a Slot Rally Championship in the UK - held at 8 clubs around the UK with various classes for different types of cars/classes. Most of the collection consists of RTR (Ready to Race) or off the shelf cars, but there is a large number of prototypes, one off specials and over recent years more and more re-liveries/re-paints and i have recently begun to have specific cars made to order in resin (the most recent being the Skoda Fabia S2000 IRC). I guess like many on this forum, i produce my own decals (Waterslide/lazer) and wish i had access to an Alps printer for white decals. I'm always on the hunt for that elusive logo reference for some obscure logo from the 60's, 70's, 80's. I used to rally 1;1 scale with a Historic MG Midget (stage and road). Skoda Fabia S2000 IRC - the master body is finished, rear wing done, just popping 50 bodies, windows, lights, wings etc - plan to do about ten liveries, but so many to chose from it's hard to stop. The next major event i will be going to is the UK Slot Car Festival on May 20th at the Gaydon Motor Heritage Centre, where we will holding a public slotrally event and displaying a small selection of my collection and some of the more recent resin slot rally cars; Clan Crusader, Rover SD1, Volvo Amazon, etc, etc. Good afternoon Gareth, and welcome to the forum! What a small world it is then, as our paths have crossed in the past even though you may not realise! My name is David Sims and I think Scott added you to my Austin Rover Motorsport group on Facebook, and his own British Leyland Motorsport group. Having seen your model work before, I am positive that they will be of great interest to the members - and that you will also benefit from being a member. If you need anything - just shout! Nice to see you on board. Yep - Good friends with Scott - it was a post on FB Austin that alerted me to this forum (somone looking for a 6R4 model). Without trawling through the entire forum, is there anyone on here that does white decals to order????? (wishfull thinking). Thanks for the kind words about my models - i try my best, but when it's something special i do have a small band of pro model makers who build some kit up for me. 1;32 Scale, MSC Donor car stripped and repainted - decals by me. Welcome to the forum. Got to say the 1st picture you post is absolute quality build. Well done. Look forward to seeing more. It is indeed a small world Gareth, however mine (and most people's on here!) is evan smaller at 1/43rd lol! There are a couple of people that print white for themselves, but I am not sure if they do individual jobs for other people. Nicky (Nicky6R4) has recently contacted a company www.redfirecracker.co.uk - and they have even registered on here as Red Firecracker I think? - and it might be worth contacting them about any plans or ideas you have mate. 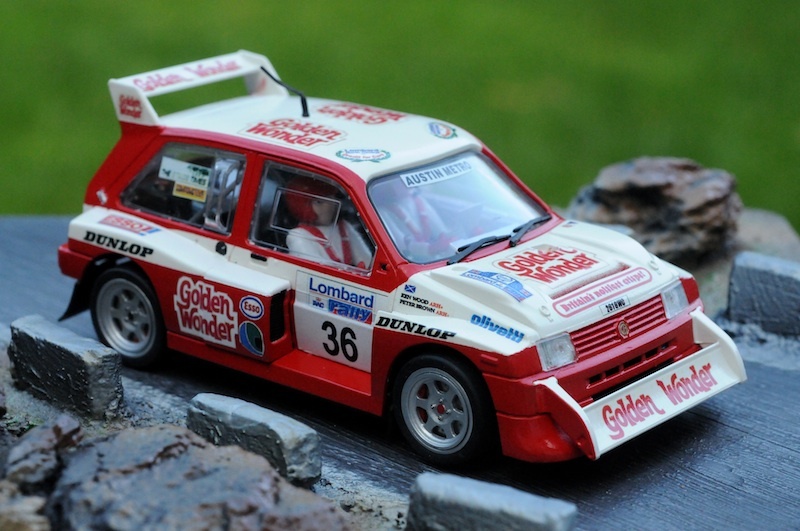 That Ken Wood 'Golden Wonder' 6R4 is an absolute stunner Gareth - a very nice job you have made of that! I don't suppose there would be any chance of reducing your 1/32nd scale decals to 1/43rd, and printing out a set for me would there? Drop me an email David and i can send you what you have - what is the percentage drop from 1;32 to 1;43? I had to draw many of the logos and never managed to find the logo for "Stage Times" that was on the rear window. All the models i make up into slot cars are 1;32 scale. This is how how i have got - the master has been made and the first pull resin taken (so it can be used as a two part master) - the rear wing arrived today, the chassis is a donor SCX slotcar. The decals - I'm working on - hence the flat paper artwork (i print to check dimensions etc). This was the first master. I cant take any credit for the superb craftsmanship in making the master - this was all done for me. The windows and front light covers are taking longer than hoped for. The rear wing (complete with photo etch end plates) are ready. Decided to spray up the prototype body in Skoda Rallye Green (rattle can) and test fit it on a chassis. Two liveries done, but working on more to fill a sheet prior to printing. 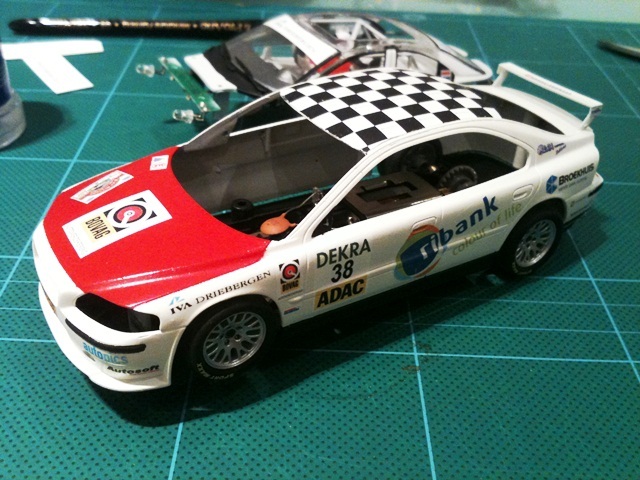 On the "To Do" list - Monte 2011 - Freddy Loix - It's a very tricky livery to get right especially on the sides and requires some serious paint masking. was in the attic, and look at what were the first 3 cars I came across.